In 1983 a tragic story unfolded in the Baltimore, Maryland area. Stephan Johnson, 28, told police that he thought his son was Jesus Christ and had to die for the sins of the world. He was charged with first-degree murder in the decapitation of his 14-month-old boy. Johnson began arguing with his wife Carla, 26, in the kitchen of their Randallstown home Sunday evening and told her that he was God and that his son was “Jesus Christ reborn,” police said. When Ms. Johnson tried to grab the child from her husband, he cut her on the shoulder. She then ran from the house to call the police. After authorities arrived, a paramedic tried to talk Johnson into giving up the child and the man refused. A few hours later Johnson held the front door slightly ajar and police saw that he was holding something in his arms. The police said it became obvious by the blood on Johnson’s body that he was holding the child. Officers forced their way into the home and as they grappled with Johnson, the severed head of his son fell to one side of the hallway while the body fell to another. 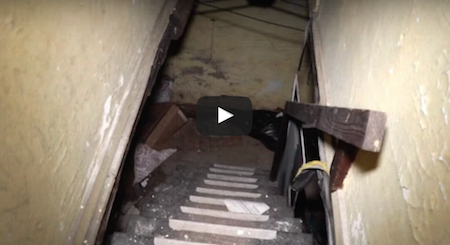 Below is video of inside this house of horrors several years after this terrible murder.